If your company is thinking about investing in a trade show display and exhibits, this commitment can seem quite overwhelming. Not only can a personalize trade show display provide a considerable initial investment, but businesses either new to the new promotional conference circuit or that just participate in a few big functions a year, may find that the time they have spent update the stands and then shipping it to different locations can be extremely tough to manage. On the other hand, businesses that do not intend to absorb the responsibility of owning themselves a display outright do have one other viable option, and that is to opt for trade show booth rentals! You do not know if a trade show booth rental is viable option for your business or not? It is vital that you learn about some of the key aspects and vital advantages associated with trade booth rentals to better streamline your decision making. The very first thing that the businesses notice while renting a trade show booth rental is the convenience it offers. For all such businesses that are new to the promotional conventions, this turns out to be an invaluable commodity. 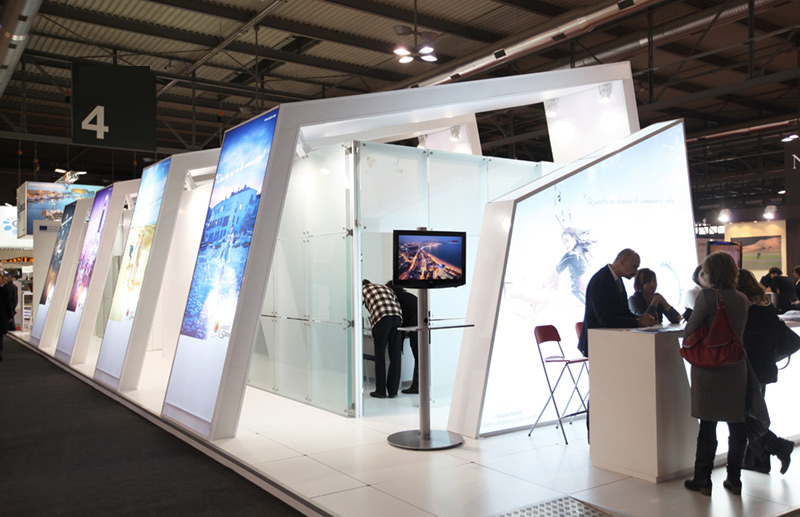 Rather than spending hours first designing the booth in house, a business can convenient get in touch with services such as Exhibe Portable with their tradeshow booth rental requirements. A professional service such as Exhibe Portable will assess your requirements, graphics and layout, and will provide you with a finished product which is best for the floor pan of the venue itself. The best part is, the vendor will ship the trade booth in advance and will also help manage all the setup requirements. Your staff just needs to exhibit the booth to the event. Is that not extremely convenient? Furthermore, trade show booth rentals offer numerous options and features for a perfectly customized look. Partnering with a vendor can help you have your business logo, graphics, and color schemes throughout the rental display booth. Having such imperative brand components will deliver an exclusive appearance and will help the event attended quickly locate you at the marketing convention. In addition to this, after the event, you can discuss in with the vendor about the overall success of the tradeshow and make any changes if required to your rental booth layout in time for the next show! Save More With Trade Show Booth Rentals! Last but not the least, one of the most crucial advantages that businesses enjoy hiring booth rentals at the trade shows related to the bottom line expenses. A rental booth costs only a fraction of what buying a trade booth costs. Businesses that are just starting out in the trade show, or even companies that only get to participate in a few trade shows a year, can opt for rental display booths without fearing that the cost of their tradeshow rental is going to devour any profits that they would be made from attending the event. Obviously, many businesses that initially start off renting a trade booth usually opt for an outright purchase after seeing how effective and successful these trade shows can be. It is imperative for them to keep this aspect in mind while sourcing a renting trade show booth vendor. Make certain that they also provide you with customized booths for purchase will indicate that your business does not have to start over the search process again in case you have to move forward with a booth of your own.